Objectives: In this prospective study we evaluated (i) whether the 2010 ACR/EULAR criteria would include patients who were classified as early rheumatoid arthritis (RA) according to the 1987 ACR criteria, and (ii) outcome by classification of patients who were initially classified as undifferentiated arthritis (UA). 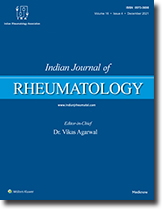 Methods: Eligible cohort (all patients with at least one clinically swollen joint) consisted of 134 patients, of which 120 had clinical diagnosis of RA. All patients were classified using both 1987 and the 2010 criteria at the beginning of the study and 1 year later. Results: Out of 134 eligible patients 102 were classified as RA based on 1987 criteria. A total of 82 (80%) out of 102 patients were seropositive for RA, i.e. positive for either rheumatoid factor (RF) or anti-citrullinated peptide antibody (ACPA). According to the 2010 criteria, 86 (84%) out of the 102 patients were classified as having RA. Among the 82 seropositive pa- tients, only 1 (1.21%) patient was classified as not having RA whereas, among 20 patients who had seronegative (both for RF and ACPA) RA, 15 (75%) patients were not classified as RA according to the 2010 criteria. Sensitivity and specificity of the 2010 criteria was 96.67% and 92.86%, respectively, compared with 85% and 85.71% by 1987 criteria. 25% of initial UA patients were reclassified as RA by the 2010 criteria at 1 year. Conclusions: The 2010 criteria did not identify a substantial proportion of seronegative RA classified by the 1987 criteria. Therefore due care must be taken when applying the new criteria to patients with arthritis who are seronegative. Objective: The present study was carried out to test if Visser et al's 2002 diagnostic criteria for acute sarcoid arthritis (Lo€fgren syndrome) are applicable in India, a country with high burden of tuberculosis. Methods: 30 consecutive patients classified as acute sarcoid arthritis according to Visser et al's criteria were included. They were screened for TB with standard Mantoux test, radiograph of chest and if found normal, contrast enhanced computerized tomography (CE-CT) of thorax. Results: 24 of 30 patients showed a negative Mantoux test as well as normal chest radio- graph and CE-CT. These patients were labeled as acute sarcoid arthritis. There were, 6 (20%) patients who had one or more features of TB by way of a positive Mantoux test and/or mediastinal lymphadenopathy with central necrosis, or asymmetrical hilar lymphade- nopathy. The latter patients were diagnosed as having Poncet's disease, a parainfectious arthritis associated with the presence of tuberculosis at a distant site way from muscu- loskeletal system. Therapeutic response to low-dose glucocorticoid, hydroxychloroquine and low-dose methotrexate produced dramatic results among those diagnosed with acute sarcoid arthritis. On the other hand, those diagnosed as having Poncet's disease were given standard anti-TB drugs with excellent response. Conclusion: In a country with high burden of TB like India Visser et al's clinical criteria for the diagnosis of acute sarcoid arthritis (Lo€fgren syndrome) may not be very specific; TB must be ruled out before diagnosing acute sarcoid arthritis (Lo€fgren syndrome). Background: The assessment of disease activity in patients with ankylosing spondylitis (AS) continues to be a challenging issue. The currently available markers like C-reactive protein (CRP) and erythrocyte sedimentation rate (ESR) show poor correlation with clinical disease activity. Objectives: To compare serum IL-6 and hs-CRP levels between patients with AS with pure axial involvement and healthy controls; and to correlate them with Bath ankylosing spondylitis disease activity index (BASDAI), Bath ankylosing spondylitis functional index (BASFI) and Bath ankylosing spondylitis metrology index (BASMI). Methods: Sixty-two consecutive patients of AS with pure axial involvement satisfying the modified New York criteria and 60 age-matched healthy controls were recruited. In all patients, Bath indices were measured and fasting venous blood samples for serum IL-6 and hs-CRP levels were obtained. Comparison of median of serum IL-6 and hs-CRP levels was done between cases and healthy controls and levels also correlated with Bath indices by appropriate statistical methods. Results: The median serum IL-6 and hs-CRP levels were significantly higher in cases as compared to healthy controls (p ¼ 0.001). Serum IL-6 levels correlated significantly with BASDAI and BASFI (r ¼ 0.61, p ¼ 0.001 and r ¼ 0.27, p ¼ 0.032 respectively) but no correlation was found with BASMI (r ¼ -0.08, p ¼ 0.53).Serum hs-CRP did not correlate with Bath indices except BASMI (r ¼ 0.28, p ¼ 0.03). Conclusion: Serum IL-6 levels can be reliably used as an aid in monitoring of disease activity in AS patients with pure axial involvement. The classification of the systemic vasculitides has been controversial for several decades. However, over the past twenty years there have been several major developments, which means that there is pragmatic consensus regarding classification. These include the American College of Rheumatology criteria first published in 1990, and the Chapel Hill Consensus Conference definitions originally promulgated in 1994, but revised and extended in 2012. More recently the classical division of the ANCA vasculitides using clinical phenotype has come under scrutiny with evidence from epidemiological, genetic and outcome studies that perhaps these conditions should be classified on the basis of ANCA specificity into PR3-ANCA positive and MPO-ANCA positive groups. There remains, however, a major need for validated classification and diagnostic criteria, a need which hopefully the DCVAS project will address. This article focuses on 3 kinds of ratios commonly used in biostatistics and research: risk ratio, odds ratio and likelihood ratio. It clarifies the meaning of risk and odds and then delves into the respective ratios.